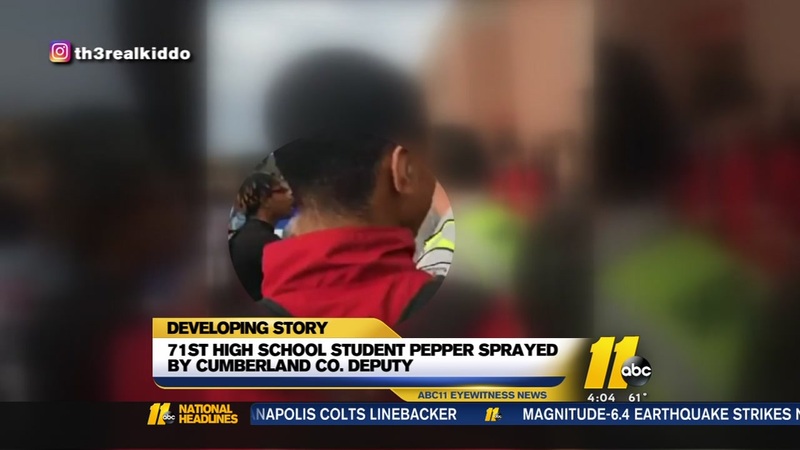 FAYETTEVILLE, NC (WTVD) -- The deputy seen pepper-spraying a Seventy-First High School student in a viral video has been cleared of any wrongdoing. On February 7, a video that surfaced on Instagram and Facebook showed a deputy pepper-spraying a student. By the next morning, the video had gone viral, being viewed thousands of times. After investigating, authorities said deputy Tajaye Murray did not show any improper conduct in pepper-spraying 16-year-old Frank Rivers. "The minimal use of force (spray) was within the contours of the law as well as the general orders and policies and procedures of the law enforcement agency," a news release stated. Rivers was arrested for resisting arrest and possession of marijuana.